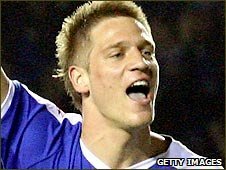 Leicester City centre-half Michael Morrison has signed a two-year contract extension which will keep him at the club until June 2012. The 21-year-old was manager Nigel Pearson's first signing and played a key role in helping the club win the League One title last season. He has already played more than 40 games for the club. But Morrison has only started three matches in the opening 11 games of the the Championship season. Pearson has instead preferred the experience of Wayne Brown alongside Jack Hobbs.